Daniel Cormier claims he would gladly give a chance for a rematch to Stipe Miocic. But only if his “big money fight plans” versus Brock Lesnar fall through. After all, Lesnar was tested three times by USADA. Nobody knows whether he will be eligible to fight. Joe Rogan heated the things up, asking why Cormier ignored Stipe Miocic and gave a chance to the WWE superstar Brock Lesnar. Miocic is the first man who defended UFC Heavyweight belt three times in a row. Brock Lesnar’s last win came at UFC 121! Cormier only said that he is willing to offer Stipe Miocic a rematch. But only if USADA renders Lesnar ineligible to compete! “[Miocic] should [get a rematch], but he went three [defenses]. Three is a lot different than 11,” Cormier said. “And also, if Brock Lesnar was staring at Stipe, that would happen, but I’ll tell you this right now, I’ll tell you this on record: If Brock Lesnar doesn’t make it to the fight for any reason, I’ll fight Stipe again. That is not a problem. What do you think, is Daniel Cormier looking for a way out of the whole situation? 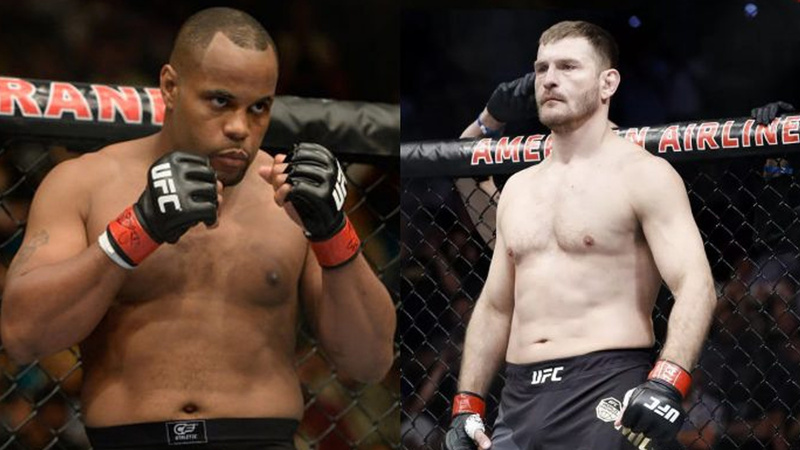 Would you like to see Daniel Cormier Vs Stipe Miocic 2?